The ANC chief of staff was speaking at the funeral of Madikizela-Mandela in Soweto. 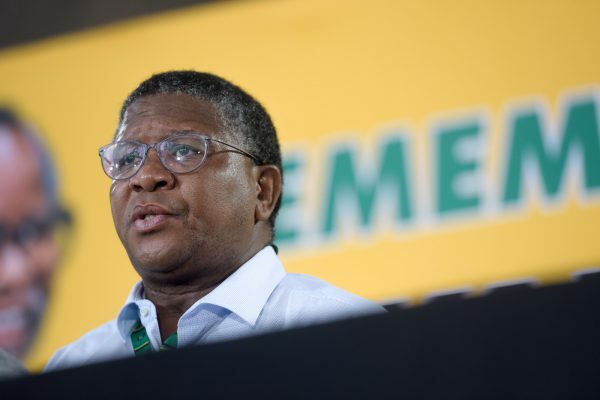 “Tell your children to come home [to the ANC],” said ANC chief of staff Fikile Mbalula. He was referring to members of the EFF in the crowd, saying they should return to the party. He was speaking at the funeral of Winnie Madikizela-Mandela at Orlando Stadium in Soweto. Mbalula, who delivered his entire address in isiXhosa, then turned his attention to land. He promised Madikizela-Mandela that expropriation of land without compensation and free education would go ahead, led by the ANC. “There will be unity, the ANC is stronger because [President] Cyril Ramaphosa is at the helm,” he exclaimed. Mbalula’s speech followed fiery speeches by EFF leader Julius Malema and Madikizela-Mandela’s daughter with Nelson Mandela, Zenani.